The SOQL Query Builder and Data Editor is a great helper in creating, debugging, or optimizing the code. It gives you the ability to learn about the results of a complex query before putting such a query in the code. SOQL is created for searching specific information within Salesforce data of your organization. It can be used in Apex statements as well as in Visualforce controllers and getter methods. correct records directly in the org instead of searching for the correct page layouts, and / or search for where the needed fields are available and editable. for a table with the results — the lower one. 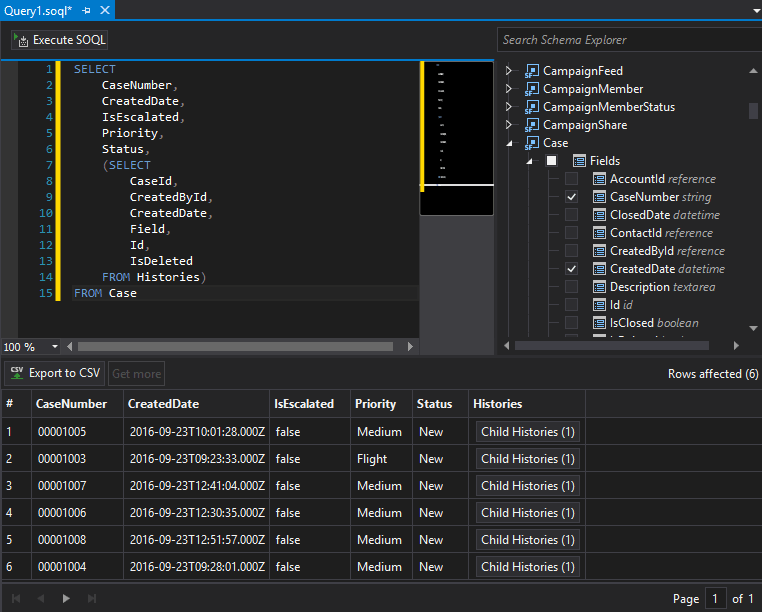 Create a new .soql file using the Adding new Items feature in the context menu of the Solution Explorer or the Create SOQL File option from the context menu of an object file in the Code Editor or in the Solution Explorer. The newly created file will be opened automatically. Use the Schema Explorer for creating your query: expand the necessary object and check the box next to the needed fields and child relations. 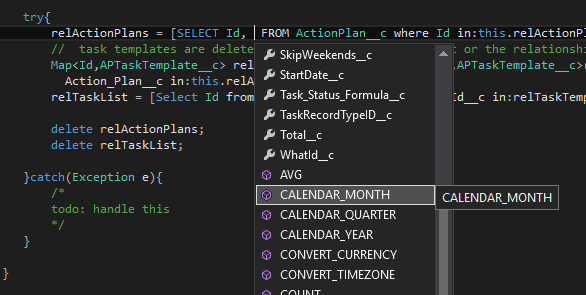 They will be automatically added to the Select statement in the query editor. In addition, the automatically added items are formatted in the nice and readable way, so the query structure is clearly seen immediately. As a side note, you can use the Search Schema Explorer filter for easier navigation. Click on the Execute SOQL button. 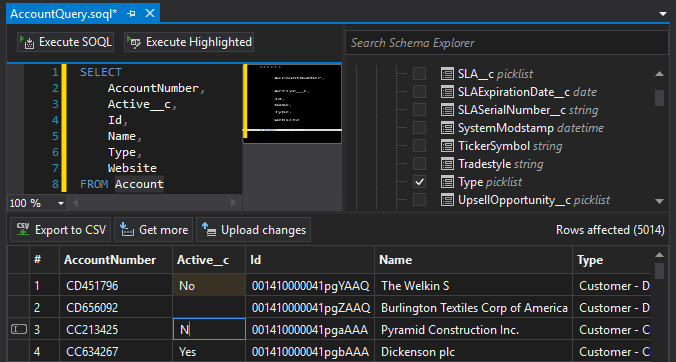 The Welkin Suite will show you the results in the lower part of the SOQL Executer according to your query. NB: The SOQL file isn't built on your org, it is saved only locally. You can also execute only some lines from the query. For this purpose, use the Execute highlighted button. NB: If you modify a query in the editor, for instance, delete some relationships, these changes are not displayed in the Schema Explorer — the child relationships still will be checked. applicable functions, that might be used in SOQL queries. After you executed the query, its results are immediately displayed in the lower part of the SOQL Query Builder and Data Editor. All the fields from look-ups and master objects are parsed by TWS SOQL Query Builder and Data Editor and displayed in a convenient way in their own columns. 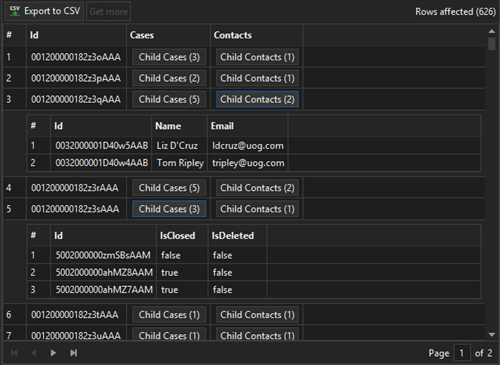 The subqueries are displayed as related lists in their turn in the appropriate result column with a count of their child items shown right there. You can open the results for your sub-select clicking on it and the sub-select will be expanded. There is a limitation of the amount of data which Salesforce returns on a query. Click on the Get more button and the next bunch of data will be downloaded. In cases when a result set contains a huge amount of data it can be split into several pages showing 500 rows per page. For quick modifying records in the org, just double-click on any editable field in the query results table and you will be able to edit the value. The IDE will highlight cells with changed values with a different background color, so if you are changing multiple fields or multiple records (or both) you won't forget what you've changed. if the field value can be set to Null or no. In the case a field is not editable, the IDE will highlight this in a hint. Set original value — if you've done any changes to the value in the selected cell, this option will revert it back to the original value, retrieved by the SOQL query. Once you're done with your changes, just press the Upload changes button in the upper part of the SOQL Builder and the IDE will try to apply them. NB: The Welkin Suite does not re-execute the query once more, so if you need to get the real values from the org afterward, you'll need to re-execute the SOQL query one more time. If you need to save a query result, click on the Export to CSV. This applies as for all those entries, that you've loaded during clicking Get more button, so for a separate subquery result also. Additionally, you can copy any value from results using the context menu of the particular cell or by double-clicking it. The Welkin Suite handles all the errors when running a SOQL query. Execution errors are displayed in the Error List Panel with a line number of an error, so you can check the reason for a fail and quickly revise your query.